Know more, catch more, and have more fun on the water. We want to help you enjoy the endless natural wonders and bountiful fish populations that characterize the coast of the great state of North Carolina. Our team of life-long anglers scours news stories, current coastal events, and all the latest fishing techniques to bring you the best information available on saltwater fishing in NC. It's simple really, we just love fishing. We enjoy hearing from our visitors and welcome feedback. Fishing-NC.com also offers North Carolina businesses a highly cost-effective way to attract new customers. Our advertising packages are available in a variety of options to fit any budget from $50 to $5,000. We understand the importance of return on investment to our advertisers and strive to provide advertising choices that perform. During 2006 our readership grew by leaps and bounds - we are now one of the most frequently visited North Carolina fishing websites. We welcome questions and feedback, please let us know if you have either. Kendyle moved to North Carolina in 2000 from Mississippi to become the Assistant Director of the Coastal Conservation Association of North Carolina. 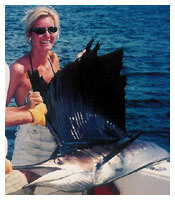 She quickly found that the North Carolina fishing community was a close knit group of incredible people. Kendyle currently lives in Raleigh and when she is not working on Fishing-NC.com or able to sneak down to the coast, she moonlights as a marketing consultant for a local manufacturing company. She has fished in numerous tournaments including the Hardee's King Mackerel Tournament and the Big Rock Blue Marlin Tournament. Austin served as the Executive Director of the CCA in North Carolina for three years and has been close to the NC fishing community ever since. After leaving the CCA, Austin worked as a representative for Shimano for most of Virginia, North Carolina and South Carolina's tackle shops. Austin now lives in Raleigh but spends a great deal of time on the Carolina coast. She has fished in Costa Rica, the Abacos, the Keys and almost every tournament in North Carolina, and is a regular at the Big Rock Blue Marlin Tournament. Scott is a native North Carolinian and has fished the Carolina coast all his life. Although he grew up fishing mostly offshore from Morehead City, Scott has recently developed a passion for light-tackle inshore fishing and is diligently working to improve his skills. Any time the weather and his schedule align you'll find him somewhere on the NC coast with a rod in hand. Scott is the general manager of FishingNC.com and handles all of our operational needs. If you have any questions about the site or suggestions for improvement, you need to drop him a line. When he's not fishing, Scott works as a web marketing consultant for a high profile list of clients. Although Taylor grew up fishing Jordan Lake and the Eno River, during his studies at UNCW he learned the art of saltwater fly-fishing for inshore species like trout, bluefish, redfish and flounder and he has been in love with it ever since. Taylor fishes regularly on the Southern NC Coast and often travels to Georgia and Florida chasing the bite. He has also become an expert at fly tying and believes there is something very rewarding about catching fish on a fly tied with your own hands. When Taylor is not on the water, he moonlights as a golf instructor in Durham and is a scratch golfer but often says he would rather spend 4 hours on the water skunked, than shoot a 69 on the golf course. Taylor will be heading up Fishing-NC's new saltwater fly-fishing section.